Over the past year, chances are you’ve heard the name Timothée Chalamet just about a million times, but with the Golden Globes effectively kicking off the 2018 awards season on Sunday, you’d better familiarize yourself with the breakout actor — and your brand new crush. The 22-year-old actor has either won or is a frontrunner for every major Best Actor award for his stunning portrayal of Elio in Call Me By Your Name, which depicts the summer romance between Elio and Oliver (Armie Hammer) in 1983 Italy. And coupled with another breakout performance in a major supporting role in 2017’s other most talked about film, Lady Bird, Chalamet is already being lauded as the next big name in Hollywood. So who is Timothée Chalamet? Timothée — definitely not Timothy — Chalamet is a New York City native who began acting while studying at LaGuardia High School, NYC’s acclaimed performing arts high school. He had a recurring role on Homeland and played Matthew McConaughey’s son in Christopher Nolan’s Interstellar. And, if you’ve spent any time on the internet, you’ll recognize him from that video high school Chalamet, nicknamed Lil Timmy Tim, rapping about statistics. Seriously. The young actor is also fluent in two languages, with a proficiency in a third. While born and raised in New York, Chalamet’s father is French and he grew up summering in France. Additionally, for Call Me By Your Name, Chalamet spent a month and a half in Italy immersing himself in the language, so yeah, he can charm you in three languages. But while Chalamet’s mesmerizing performance as Elio, a 17-year-old boy experiencing a semblance of love for the first time with Oliver, is garnering him all the awards — and rightfully so because it truly moving and incredible — his role in Lady Bird, couldn’t be further from Elio. As Kyle, Chalamet plays a high school anarchist-wannabe, who reads Howard Zinn for fun and prefers bartering to spending money. In addition to being an incredible actor — seriously, he’s so good, a monologue his character performs in a movie was so good, it was singled out by critics — Chalamet may just be the most adorable human being on the face of the Earth. Being in two of the most talked about films of the year, Chalamet made his first real foray into the world of press tours — and it was the best thing ever. Vulture recently referred to Chalamet as “a superfan who made it big” and it may just be the most accurate description of the young actor, who gushed about getting a shoutout from Cardi B, and has spent much of the last year in complete disbelief over his phenomenal sudden success. This whirlwind press tour has not only showcased the awkward charm of the young actor, but also proved that the chemistry he had with Hammer on-screen is just magnetic off-screen. Throughout the press tour, the two finished each other’s sentences, gushed about one another, and genuinely seemed like the best of friends. 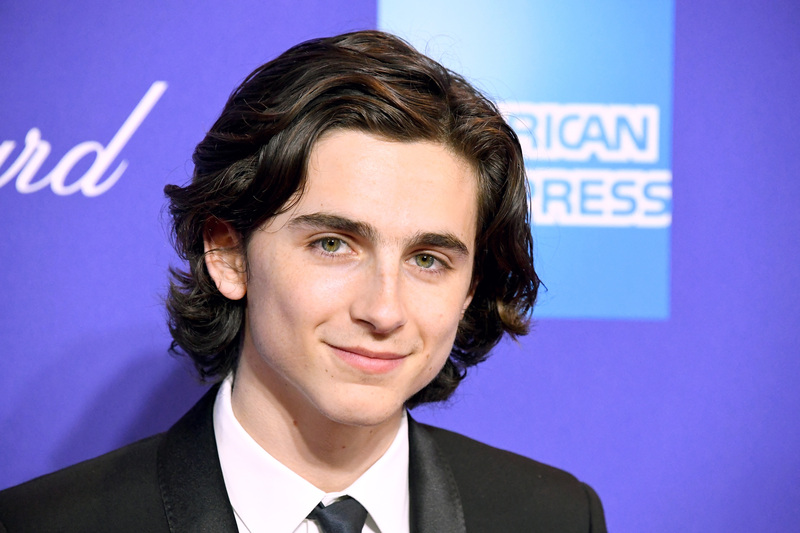 While accepting the rising star award at the Palm Springs International Film Festival Awards Gala, Chalamet gave Hammer and his wife, Elizabeth Chambers, the most adorable shout out. "Seriously, I'm grateful for your big brotherhood and your guidance and your friendship. To have someone in your position, and as talented as you are, be a mentor to me for the last two years is invaluable to me. I really mean it, man," he said. "And special thanks to Armie's wife, Elizabeth Chambers, who is here tonight, as well, who is as crucial to this process as anyone. And for letting me crawl all over your husband for two months. Thank you for that." If that’s not the most adorable thing on the planet, IDK don’t know what is. So if you’re still not entirely familiar with Timothée Chalamet, keep studying up because he’s about to take awards season — and Hollywood — by storm and you’re not going to want to miss it.